Home Sheducation Centre Is it Time for a New Barn? Is it Time for a New Barn? On many farms, the barn is like an old family friend. Some friends age with dignity and class, and look younger than their years. Sadly, though, the years can be rough on some of our friends, and they become a bit “frayed around the edges.” Which category does your barn fall into? Most farmers are very handy with repairs. Many barns were built by the fathers or grandfathers of the people who currently own them. Over the years, they get repairs and patch jobs, and it usually works out all right. Sometimes, your barn needs a coat of paint to look as good as new. 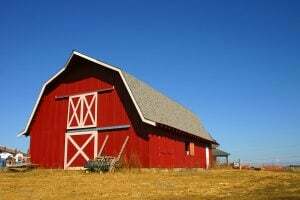 But can a fresh coat of paint actually make a barn as good as new? We think we all know the answer to that question. Many people don’t want to even think about building a new barn, because building one out of wood involves a lot of time and money. So, we keep on patching and painting, getting one more year out of our barn, hoping it doesn’t start to develop any serious problems. But eventually, they do. And eventually, the time comes when it can become more expensive and risky to keep repairing your barn than it would be to build a new one. If you think you can’t afford to build another barn, we may have exactly what you need. Our barns are sturdy, ShedSafe approved, and cost a lot less than you may think. We have barn kits that are surprisingly inexpensive, and provide great value for your money. We can build a barn to any specifications you need, and we have both Australian and American design barns. Because our barns use the same technology and material as our industrial and commercial sheds, they cost a lot less than wood or bricks and mortar. Because we are ShedSafe certified, they are guaranteed to be safe, and are often more sturdy than wood barns. They come with a 10 year structural warranty, and a 15 year cladding warranty. We can deliver and build a barn anywhere in Australia, or we can just deliver a kit and let you erect it yourself. Either way, you will be getting a sturdy, reliable barn for as little as half of the price of building a conventional barn. Contact us for an estimate today. You’ll be happy you did.